The Litter Lifter™ comes in three sizes and 14 colors. I used the smallest size, sold as the Travel model, because I found it easiest to maneuver in the corners of the box, but I think the larger ones would probably make clean up even faster if I could get used to them, and they would probably be a better choice if you have a lot of boxes to scoop. For more information about the Litter Lifter™, please visit their website. You can purchase directly from Litter Lifter™ and at many retail stores. here on The Conscious Cat in two weeks! FTC Disclosure: I received this product for review at no charge from Litter Lifter™. I also received a small fee for writing this review. Receiving the free product and the fee did not influence my review. All reviews on The Conscious Cat will always reflect my honest and unbiased opinion. STAINLESS STEEL all the way!!! Sooooo much better than plastic. It sounds ideal – and I was interested to read various comments about such things. I think my two sometimes wonder why they bother covering, too, Margaret, because I scoop so soon after they use the box! I got a Litter Lifter at BlogPaws and I love it! Alice from the Palace is our litter monitor and she will come from anywhere to snoopervise the cleaning. These are new to me. I am always looking for better ones as some of the plastic ones are cheaply made and hard to use. Thanks for the review. Will have to give this kinda a try. I had that same problem with the larger sizes. which is why I went to the travel size, Michelle. Good idea! I haven’t seen those around here in stores, I actually didn’t know they came in different sizes until you posted this review. I will definitely order the travel size as I have really enjoyed the way it performs. I’ve used this litter lifter for 5 years now and cannot imagine using anything else! In all my years of being owned by cats I have never found a single scoop I really liked – until this one came along. Love it! After I wake up each morning and splash my face, I pull out the newspaper and start my litterbox rounds. We have seven boxes that are spread out around the house, but there are usually only three that have been used in the past 24 hours. I scoop onto the newspaper, then proceed to the next box, then the next. When all done, the newspaper is rolled up and placed inside a plastic bag (usually, one that comes ON the newspaper, or a bread bag) and discarded. The cats seems to appreciate the routine, and I draw squiggly lines in the litter when I’m done so I can easily tell which one’s were used. If the lines are still there tomorrow, I don’t have to police that box! 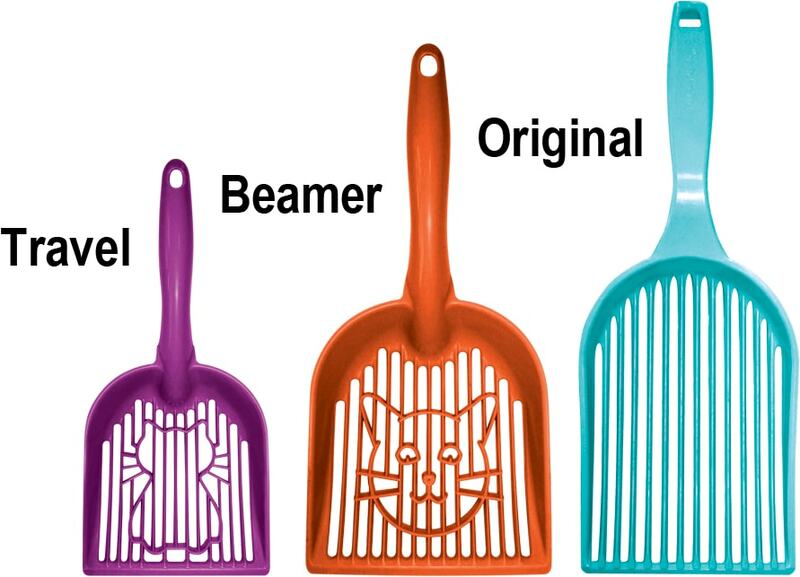 I’ve never found a litter scoop that I’ve really liked, and I keep one at each box (instead of having to carry between boxes). I’ll check out a Litter Lifter when at the pet supply store this weekend. That sounds like a great routine, Vickster. Let me know how you like the Litter Lifter. I absolutely love this scoop and refuse to use anything else. Mine has lasted well over 4 years AND looks brand new! I lost one moving and I bought another one until I found my first one because the boxes still needed scooping, but I couldn’t bring myself to use anything else. I donated the first one when I found it since I only need one, but if I ever see someone at the store that looks perplexed about the scoops, I hand them the litter lifter and say, you won’t be disappointed. I can’t say enough about this scoop and recommend it to everyone when I was working at a pet supply store. I brought my Mistletoe home as a 1 year old rescue. Her first action was to go under the bed and stay there, until I went to the bathroom. Then, she ran in and spoke to me, rubbed against my legs and ducked in to the box I had set up next to the bathroom. For 5 years after that, every time I went, she went, always with the same acknowledgement first followed by her waiting for me at the door after. It got so that I’d wait for her if she took longer than I. I’m also a creature of habit. It’s been 10 years since she came home and she’s much less shy now. That and the fact that she has to supervise 4 boxes with the addition of 3 other kitties to our family, makes our girls to the bathroom trips less frequent. But several times a week she still makes time for me. And if I’ve fallen behind on my litterbox duties, she is quick to point it out. What a sweet story, Dorothy. I live in small quarters with 5 beauties. While the litterboxes are all in the bedroom and are scooped regularly, it’s the bathroom routine that I enjoy with mine. All five race to join me each and every time I make the visit. The boys hit the tub for a little tap tag and tightrope walking on the tub edge while the youngest (Sweetie) seeks pets while lapping from a waterspout. The two older girls must get their turns and braid themselves around my legs as I twizzle their ears and all take turns drinking from the cat fountain. This, the cosiest room, seems to be the room of choice for a group social! What a wonderful bathroom routine, Dorothy! So cute! I live in a small “One Bedroom Flat” in Mumbai with 2 traditional Persian cats and a “Alexandrine Parakeet”. My cats are trained to defecate and urinate in the bathroom which is always kept open.This is most convenient as the only manual labour involved is watering down the poop into the drain.This is definitely more convenient and cleaner than having a ‘Sand Litter Box”.